Part I. Agents in the World: What Are Agents and How Can They Be Built? : 1. 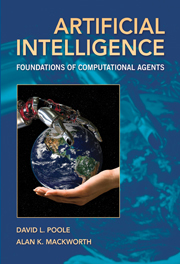 Artificial intelligence and agents; 2. Agent architectures and hierarchical control; Part II. Representing and Reasoning: 3. States and searching; 4. Features and constraints; 5. Propositions and inference; 6. Reasoning under uncertainty; Part III. Learning and Planning: 7. Learning: overview and supervised learning; 8. Planning with certainty; 9. Planning under uncertainty; 10. Multiagent systems; 11. Beyond supervised learning; Part IV. Reasoning about Individuals and Relations: 12. Individuals and relations; 13. Ontologies and knowledge-based systems; 14. Relational planning, learning and probabilistic reasoning; Part V. The Big Picture: 15. Retrospect and prospect; Appendix A. Mathematical preliminaries and notation.